What Kind of Ring Should a Woman Propose With To a Man? Any casual Friends fan can remember this moment in TV land: Monica Gellar and Chandler Bing, who had been dating for some time, finally tied the knot one fateful season finale after a slew of mishaps and drama hindered Chandler’s original plan to propose. At the end of the two-part episode, Chandler is tricked into believing that Monica has gone away to think about her relationship with him, and instead finds her inside their apartment with dozens of candles lit. Monica gets down on one knee and begins to propose but can’t finish because she gets choked up on her own tears. Chandler gets down with her and says a choked up speech of his own, asks her to marry him, and the crowd goes wild! But did you notice? Monica didn’t have a ring for Chandler. We can only assume that she didn’t have a ring because she knew he had one (i.e. Joey’s involvement). But what kind of ring would she have proposed with if she didn’t know? Or even better, would she have proposed with a ring at all? There are some who say a woman should have a diamond engagement ring ready for her groom to be, a ‚Äúmangagement‚Äù ring. Some men are open to the idea of wearing diamond rings, where as others see diamonds (especially on rings) reserved for females. For these men, women may opt to propose with a wedding ring that would be intended for the ceremony’s bands. 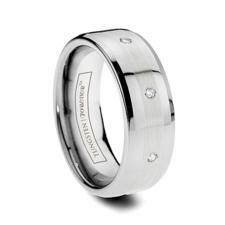 Whatever the case maybe, Tungsten World offers exceptional wedding bands for men with and without diamonds. Tungsten rings are quickly becoming a popular choice for men’s wedding bands due to their scratch resistance and affordability. Add laser etched designs and a couple of diamonds, and you have some the most unique wedding rings to choose from! If your man wants a ring with the works, this is it! The Bismarck features 8 diamond stones inserted throughout the platinum inlay of this gorgeous tungsten ring. Want to show off your dark side? Or just want to stand out from the crowd? 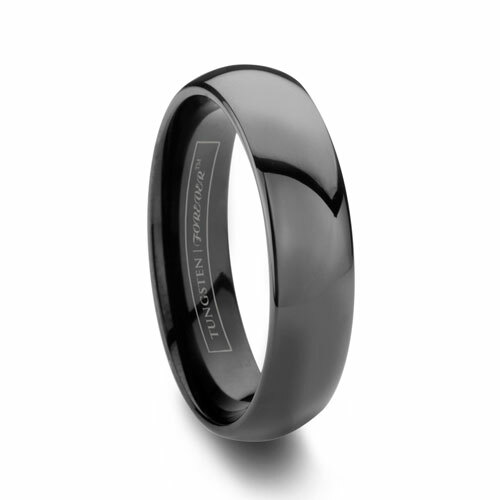 A black tungsten ring will be a sure hit on your fiance’s finger. A camo ring for your military hero! 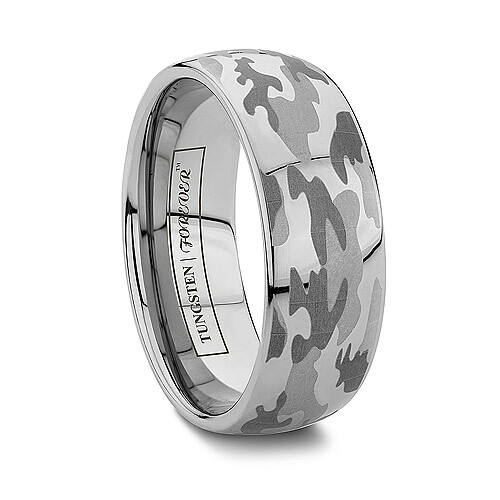 A laser etched camo design encases this tungsten ring for an amazing look like no other. One of our many precious metal inlay rings, the Halo features a gold inlay strip highlighted by raised grooves along the ring’s sides. 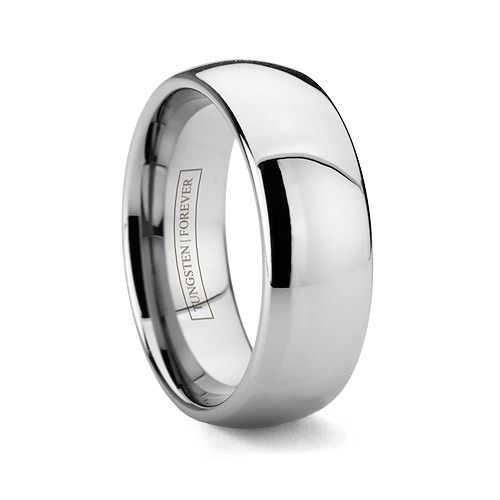 Or if your man prefers to keep it simple yet classy, the classic Moderno tungsten ring is the one you seek. Check out Tungsten World for more information on these rings and other available designs! How did you first hear of tungsten? Maybe a friend or a co-worker swore by their tungsten wedding bands and their durability. Or your significant other asked for tungsten rings specifically as their wedding band. You might have even seen a nice pair of carbon fiber tungsten cufflinks at a meeting in the office. In the wedding and jewelry industries, tungsten has garnered a reputation as the most durable alternative metal. Tungsten is now synonymous with forever wedding bands. But you might be surprised at how many other things tungsten has been utilized in, and for quite some time! Don’t forget, tungsten has been a known element for over 200 years. Light Bulbs: When Thomas Edison developed the light bulb, he went through many types of filaments before settling on tungsten as the longest lasting for his new invention. Many bulbs today still use tungsten filaments over 100 years later. Sunglasses: Yup, your shades could have tungsten in the lenses. Sunglass experts like Oakley have been using tungsten iridium lenses to perfect the polarized lenses in sunglasses. Need a pair to cut down the glare of your tungsten wedding rings’ high polish shine? Try these tungsten iridium lenses. Tungsten Drill Bits: Builders have been using tungsten in their drill bits for years. The hardness of tungsten is simply unparalleled and great for all kinds of practical uses on the job site. Race Car Ballast: NASCAR and Formula One have both used tungsten as weight and balance for their high performance vehicles. Now you can tell your friends with confidence that your tungsten ring is a high performance wedding band. NEW!!! Lots of New Tungsten Rings on the Site! 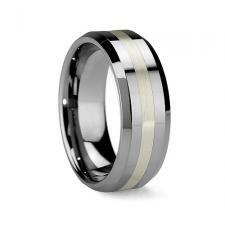 If you haven’t already, get over to www.tungstenworld.com/ and check out the newest in tungsten rings and tungsten wedding bands up on the site! New styles include: two-tone ceramic and tungsten rings, new colors of tungsten carbon fiber rings, black diamond rings, and even an amazing new women’s tungsten ring, the BELLA. Not to mention, we’ve even added tungsten carbon fiber cufflinks! So what are you waiting for? Just in time for the busy summer months, and the most popular time for weddings, Tungsten World has got all your tungsten carbide needs covered. Looking for a Father’s Day gift or a unique gift for a recent graduate? Look no farther than the tungsten rings across the pages of TungstenWorld.com. Whether it’s a ring with a special engraving to Dad or an upgrade on the traditional college ring, tungsten carbide rings are the perfect gift for any occasion. The top of the line 8-stone platinum inlay diamond tungsten wedding band from the Tungsten Forever‚Ñ¢ brand, what can we say that hasn’t already been said about it? Well, if you need more description of this incredible tungsten wedding band, check out our Product Spotlight on the post on the BISMARCK. A classy ring of understated beauty. The two polished grooves frame an elegant round-cut solitaire diamond of .06 ct. Perfection. Identical to the BISMARCK, but with a 3mm sterling silver inlay holding the 8 diamonds in place. 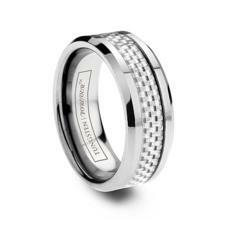 For those looking to get an 8 stone tungsten diamond ring but aren’t quite able to reach as high as the BISMARCK. A simple pipe-cut style with 950 Platinum inlay. Understated, but as brilliant as any tungsten wedding band out there. Looking for a different kind of inlay? 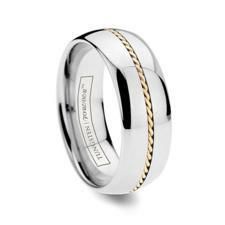 Try this handwoven 18k yellow gold inlay tungsten ring. The braided pattern of the gold inlay is sure to turn some heads. 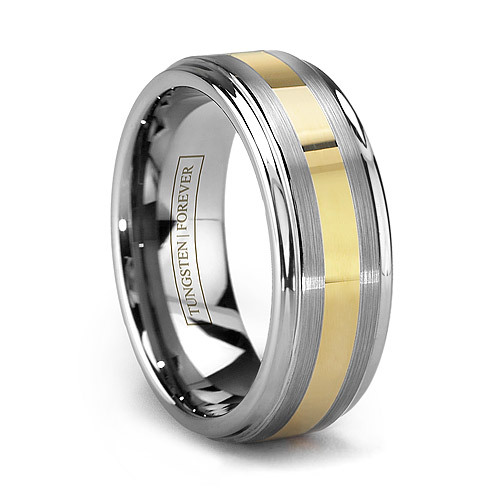 This beveled-edged inlay tungsten ring has been a favorite of ours and our customers for a while. Inlaid with high-quality 925 Sterling Silver and stunning from close or far, it’s no wonder this is one of the most popular tungsten rings with inlay year in and year out. 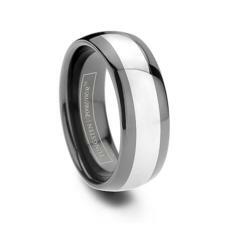 Stand out from the crowd in this ionized beveled, polished black tungsten wedding band. And in 3 width choices (6mm, 8mm and 10mm) you’re sure to find the style that fits you best! A two-tone domed ceramic inlayblack tungsten ring we’ve loved since it’s introduction to our site. The interlocking Gaelic pattern of this ring symbolizes everlasting love and makes the perfect matching wedding band set. This white carbon fiber tungsten ring with beveled edge looks as fast and stunning as the race cars that share its carbon fiber detailing. Don’t let this ring pass you by. 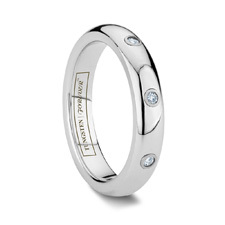 Spring is quickly approaching, and that means wedding season and tungsten wedding bands! As we move into warmer weather, Tungsten World wants to give you $35 off your tungsten rings or tungsten jewelry purchase through our site. Use the promo code: SPRING35 during checkout to receive your discount. Use it on anything frommen’s tungsten wedding bands to women’s tungsten rings and even our selection of tungsten bracelets and tungsten watches. We’ve added even more upgrades to the Tungsten World homepage in preparation for the quickly approaching wedding season! Now added tothe site are tungsten rings’ categories with Men’s Tungsten Wedding Bands, Women’s Tungsten Rings, Tungsten Carbon Fiber Rings and Tungsten Celtic Wedding Bands. In each new category, you’ll find new styles of tungsten rings and tungsten wedding bands relating to your selected category. Also included are new widths for many of our styles; 4mm width bands great for women and 10mm widths great for men.